© 2018 XO Patisserie. All Rights Reserved. 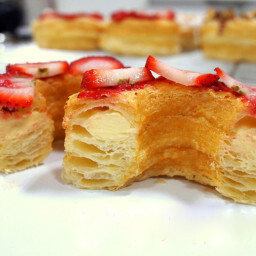 Voted into TIME Magazine’s Top Inventions of 2013, Cronuts are a hybrid of a CROissant and doNUT… layers of croissant-type butter pastry, cut and fried like a donut. Our cronuts are filled with cream, have a flavoured-sugar base-coating, and are topped with a contemporary flavour. A must-try! You Only Live Once! 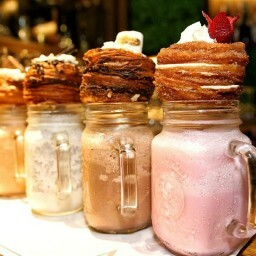 Featured on EatOut and Grazia Magazine, our Cronut Milkshake is an indulgence not to be missed. A double-thick Stracciatella (Vanilla/Choc) or Coffee-Chocolate Sicilian Gelato-based shake, topped with a cronut. XO has an exclusive partnership with EARTHENTIC coffee. 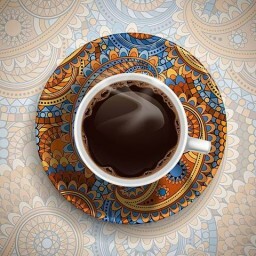 Earthentic is a remarkably tasty blend of Guatemalan and Columbian coffee. The beans are roasted to a signature light-medium profile, accentuating the flavours of origin for maximum enjoyment. Our clients often wonder why we only serve cronuts, because surely if we do this so well, we would be great with other products too. The answer is simple: focus! It is our focus that gives us the ability to maintain an artisan-offering of high quality that our growing customer-base has come to appreciate. Every cronut is hand-made with love, devoid of any mechanical process that would lead to a synthethic flavour experience. We clearly love what we do. Become part of our growing family of cronut addicts who now believe that a balanced diet is a cronut in each hand! Get a regular delivery of cronuts so you’re never without your sugar-fix. The process is simple and completed in 2 easy steps. Love our cronuts and want your friends or colleagues to share the indulgence? Click on the link below to send us your order via email. Never miss out on our special offers and flavour updates! Click on the link below to sign-up for our newsletter.